How a French winery more than 270 years old re-invents itself with a summer champagne meant to be enjoyed with ice. 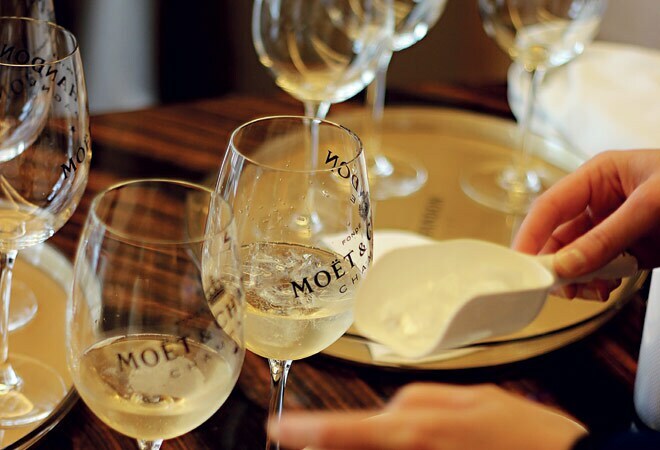 Adding ice to the champagne brings out hidden flavours. Summer 2015 beckons, with an enticing promise of stolen escapes with friends in the sun. From rooftop pool parties to beach resort carnivals and private yacht getaways, who said summer can't be fun, especially if you have the money. This summer, champagne brand Moet & Chandon answers the call with Moet Ice Imperial which is a luxuriously groundbreaking take on a flute of bubbly. What is unexepected, and sets the fizz apart, is that it is the world's first champagne created to be enjoyed on ice. In the south of France, where open-air picnics are a staple, winemakers noticed friends dropping ice into their champagne. The resulting diluted concoction would mute the rich flavours entirely. This new champagne experience combines fun, fresh and free sensations while remaining true to the brand's style, a style distinguished by its bright fruitiness, seductive palate and elegant maturity. Winemaker Elise Losfelt of Moet & Chandon, visited New Delhi recently, to introduce Indians to Ice Imperial and take us through the right way to serve it. Losfelt is one of ten winemakers at Moet & Chandon and is part of the team that controls the quality of every champagne produced from their vineyards in the Champagne region of France. "As a winemaker my biggest challenge is to reproduce the style year after year. It is an act of trust. Consistency means anywhere at any time you will have exactly the same experience," says Losfelt. Moet Ice Imperial is built with the three main grapes of champagne, Pinot Noir, Pinot Meunier and Chardonnay. Since it is a non-vintage wine, more than 100 different blends of wine are used to achieve the consistency the brand is famed for. It contains more of Pinot Noir which gives it structure and a touch of astringency and bitterness which disappear when the ice cubes begin to melt. This structure is important to support the elevated levels of sugar at 45 grams per litre. The Pinot Meunier adds to the fruitiness, fleshiness and richness of the bubbly and the Chardonnay brings acidity and tails off the juiciness, adding to the refreshing nature. While champagne on its own is a classic, embellishing it with the right summer accompaniments gives you more for less. From mint leaves to lime, white grapefruit zest, cucumber peel, very thinly sliced ginger, cardamom seeds and even red fruits like strawberries and raspberries, the sky's the limit when dressing up this summer favourite. The champagne's fruity and intense nose combines the aromatic flavours of mango and guava, the generosity of stone fruits such as nectarine, and an original note of raspberry and gooseberry. The result is an explosion of summer in your mouth, the captivating sweetness of caramel and quince jelly with the refreshing acidity of gooseberry. Ice Imperial is a deep gold colour with amber highilghts and looks and tastes like heaven. To accompany summer escapists at their dream summer spots, the brand presents the Summer Escape Trunk. A limited edition piece designed exclusively in France, this is the symbol of celebration; the quintessential summer gift. From the outside, it looks like a white trunk, but once open, it houses bottles of Moet Ice Imperial, glasses and even ice (since it is a refrigerated travel case). Everything you need to stay afloat. Chill the bottle to 7 degrees Celsius. Ice Imperial has a higher sugar content than normal (called demi-sec) balanced with high acidity and the delicious, tropical flavours come out best when served chilled. Select a large wine glass, such as a Bordeaux. A traditional flute can shoot an unpleasant whiff of carbon dioxide on the nose and the short rim will have the liquid touch the middle of the palate and not the front, eliminating the full flavours. After pouring 120 ml of Ice Imperial, add three large cubes of ice. The champagne is crafted in such a way that ice cubes have to be added to give the right balance on the palate.